General Atomics Aeronautical Systems (GA-ASI) has contracted MBDA and Raytheon UK to carry out integration work of their respective weapons onto the developmental MQ-9B SkyGuardian unmanned air vehicle. A ceremonial signing took place in London on January 24 following contract awards being granted in 2018, and work has already begun on integration of the Brimstone air-to-ground missile and Paveway IV laser-guided bomb onto the aircraft. The work is part of a requirement from the Royal Air Force to incorporate British technology within its acquisition of the MQ-9B for its Protector program, through which it is teaming with 12 UK companies that are exploring their involvement in the different elements of the aircraft’s design and operation. Protector will be able to carry three Brimstone missiles per weapon station and, when it enters service with the UK in the mid-2020s, it will join the RAF’s Eurofighter Typhoon in operating the weapon. In addition to the integration contracts signed with the weapons manufacturers, GA-ASI also entered into a memorandum of understanding with BAE Systems to work on airspace integration efforts for the certifiable UAV, which includes helping define the concepts of operations for the capability. Other contracted companies include CAE, which will leverage its experience in providing the training systems for the MQ-9 Reaper to provide a synthetic training system for Protector, early deliveries of which are expected to take place in 2020. Additionally, Leonardo is now offering its SeaSpray 7500E for integration onto SkyGuardian and is working with GA-ASI on efforts to further test the system. 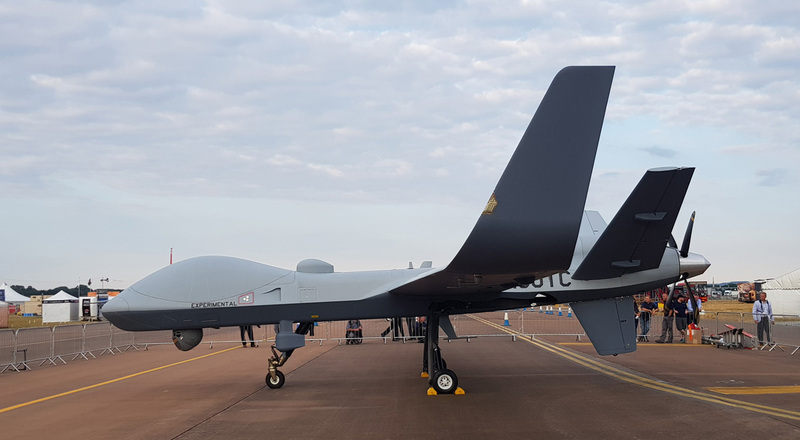 The company has already worked with the OEM to offer its Sage ESM system for the MQ-9B and is hoping to be able to provide a package of sensors for the RAF and/or other customers of the UAV. Notably, the RAF has contracted GA-ASI for the development of MQ-9B for the Protector program, but a production contract has yet to be signed. While there is an evident momentum in the program—SkyGuardian became the first medium-altitude, long-endurance UAV to make a transatlantic crossing in July 2018—there are still elements of the capability that need to be addressed, most notably for a detect-and-avoid radar that is not yet contracted under the terms of the agreement between the RAF and GA-ASI. General Atomics is offering its Due Regard Radar that will facilitate the MQ-9B’s use in national airspace, and RAF officials noted that this will inevitably have to be considered at some point prior to the UAV being used in this way. The RAF stressed that the process that the UK is going through to acquire its Protector fleet is essential to it receiving the configuration that it wants, as well as developing a system that could potentially be exported from the UK. While the weapons capability is important for the RAF in order for it to replace the in-service Reapers, the opening up of the system to include airspace integration is providing the RAF with an opportunity to provide civil assistance much in the way some of its manned fleet does. Air force representatives noted that part of the planning for the UAV’s operations is taking this into consideration, as the service prepares to aid civil agencies during crises such as the aftermath of a natural disaster.